I get so many things done in 2 h 20 on the Eurostar, it’s amazing! Reports, worksheets, presentations, everything gets done very efficiently. So I started wondering why is it the case? Here are the answers and the conclusive 5 best office productivity tips ever. The main reason is that I am fully isolated from networks of all kinds, and I don’t have anyone knocking at the door. I sit down, plug in, open the laptop and I work. The fact that there is no wifi on the Eurostar can be a handicap, but in this case it’s a big advantate: no network, no e-mails, no Twitter, no Skype. Plus, there is a constant background noise but no particular events to distract me. So I actually feel like in a bubble and achieve high levels of concentration. So how could you get more productive in office? 4. Put your cell phone on silent. (even better if you turn it off). 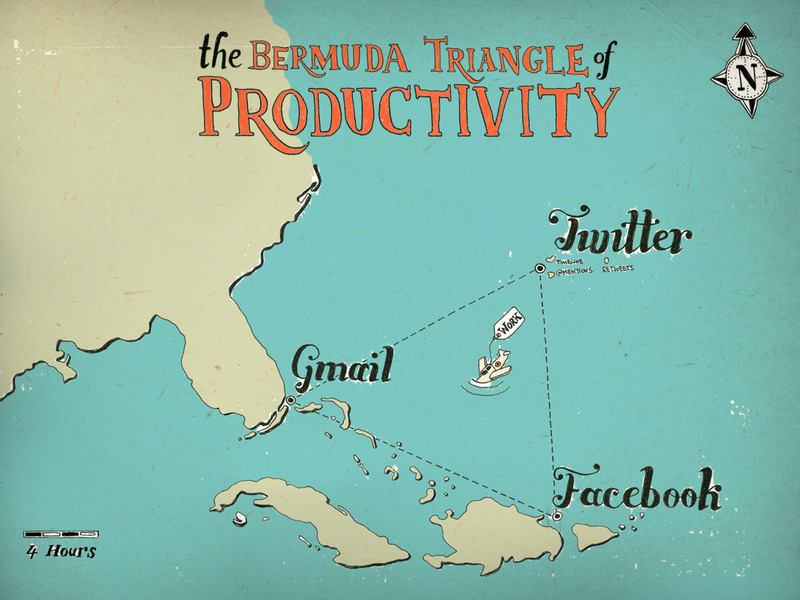 On the same lines… check out this fabulous picture: the Bermuda Triangle of productivity.